The short answer: Intellectual fun! Technically, upcyling is an activity that prevents waste by diverting material into the creating something new and useful. Cardboard material happens to have some excellent qualities for upcycling. You can find many examples online of it being used to create objects for organization. In a laboratory space, this can be as simple as making a useful freezer storage organizer. Outside the science lab, upcycling found objects has a long history in the fine arts. It's easy to cut, layer, decoupage, or collage cardboard with other materials. Cardboard can be used artistically in sculptures, or crafted into photo frames, jewelry, or even light fixtures! Upcycling is so brilliant because it intersects science and engineering with arts and crafts. It's inventive, intellectual fun! What is a Monarch Nucleic Purification kit? Basically these kits are molecular biology tools. New England Biolabs Monarch® Nucleic Acid Purification Kits are used to purify DNA into highly concentrated, small volumes. The kits are for plasmid miniprep, gel extraction and PCR cleanup. One of the goals of green lab initiatives is to reduce lab waste. Monarch® kits from NEB were created to have maximal performance AND minimal environmental impact. Their design uses minimal plastic. 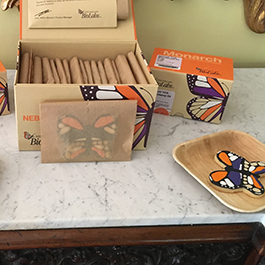 Not only is Monarch kit packaging made from 100% post-consumer material, but it has also been thoughtfully designed to be reusable. What is the Monarch Upcycle Challenge? Visit www.neb.com/MonarchUpcycle to win $1000 in credit! All submissions will be reviewed by a panel of NEB employees. One winner will be selected to receive either $1,000 in NEB product credit or a $1,000 donation to the charity of their choice. Also, for every submission**, NEB will donate $10 to the Monarch Joint Venture whose mission is to conserve the monarch butterfly population. Personally, I think that a wing from the NEB Monarch buttlerfly could make a really fun necklace or bag charm. The whole Monarch kit box would fit well into a block tower castle...made by some of the creative children of scientists out there. Good luck and have fun!